Replacing 27C256 with 28C256, how to wire /WE? I am looking to replace a 27C256 compatible maskRom (nintendo Nrom PRG and CHR if it matters) with a socketed 28C256 in order to make a development cart. Can I just float pin 27(leave unconnected)? Or would I connect /WE to +5v? 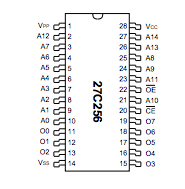 The '27 has: a. pin #1, Vpp which in circuit is not used (either Gnd or Vcc) b. pin #27, A14 which is a driven address line. The '28 has: a. pin #1, A14 is a driven address line. b. pin #27, /WE Which must be tied high in circuit. Not the answer you're looking for? Browse other questions tagged integrated-circuit flash eeprom or ask your own question. What's a good EEPROM replacement for a 27C256/29C256? 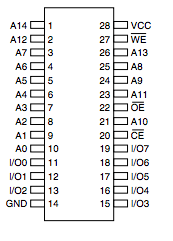 Can no-connect pins on EEPROM ever be connected to VCC or GND?